In my 3.5 years in York, I’ve never known the West Manchester Mall to have even half of its storefronts leased out and occupied. Let’s hope that its de-malling brings good results. © 2014 by The York Daily Record/Sunday News. 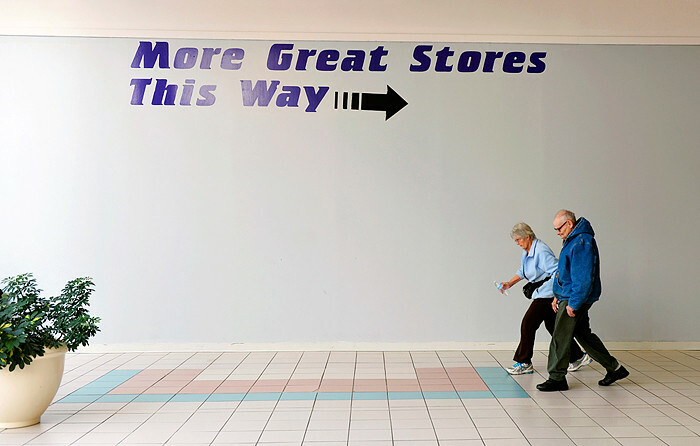 Mardell Messersmith, 75 of Dover Township, left, walks with her brother Harold Feeser, 64 of York City, around the interior of West Manchester Mall on Thursday, Feb. 20, 2014. Messersmith and Feeser have taken to mall-walking a few days a week in the past year, but security will soon ask mall walkers to cease their routines before the mall begins dramatic renovations. With the West Manchester Mall destined to give way to an outdoor town center-style shopping center, stores within the mall are shutting down and moving out. © 2014 by The York Daily Record/Sunday News. Central York student council members greet graduates after they received their diplomas and sunflowers during commencement at Central York on Friday, May 30, 2014. Central York graduated 445 seniors, 430 of whom participated in the 2014 commencement ceremony. I didn’t attend my college graduation because I had better things to do. 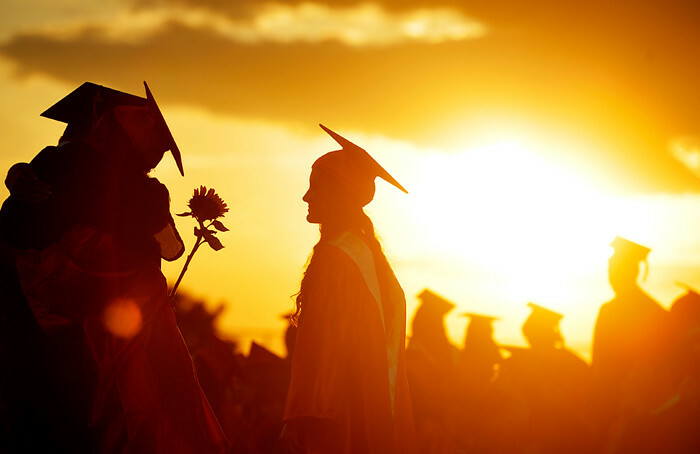 But, having photographed four high school graduations and one college graduation in the past two weeks (including three ceremonies in as many nights, in a row), I’ve probably heard “Pomp and Circumstance” enough times now to atone for not walking in my own commencement. © 2014 by The York Daily Record/Sunday News. 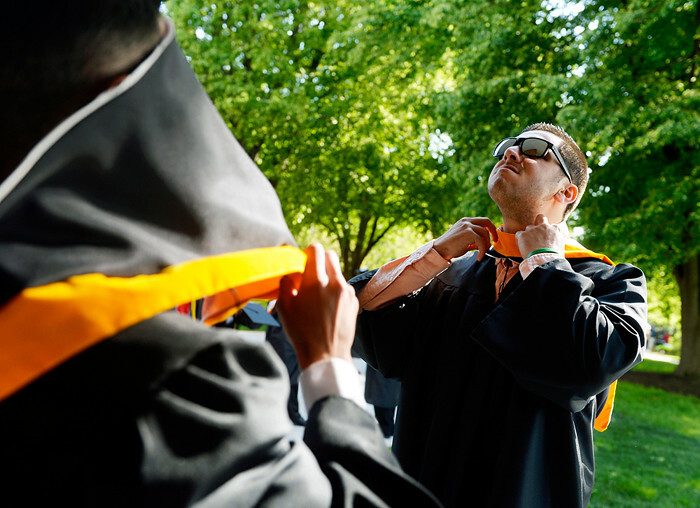 (Left to right) Stefano Colletti and James Volpe, both candidates for Bachelor of Science degrees, try to figure out their regalia before York College’s commencement ceremony on Saturday, May 17, 2014. York College of Pennsylvania’s class of 2014 celebrated its spring commencement ceremony on Saturday, May 17, 2014. © 2014 by The York Daily Record/Sunday News. 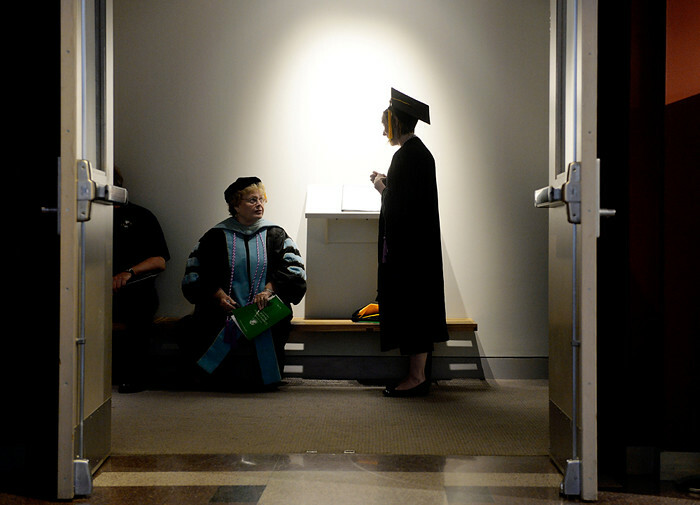 Retiring nursing faculty member Jacquelin Harrington, left, chats with fellow nursing faculty member Susan Scherr as they wait for York College’s spring commencement ceremony to begin on Saturday, May 17, 2014. © 2014 by The York Daily Record/Sunday News. York Catholic senior Ralph Maiolino, center, relishes the applause of faculty members as he and other seniors proceeded to commencement at York Catholic on Wednesday, May 28, 2014. York Catholic graduated 107 seniors in its 2014 commencement ceremony. © 2014 by The York Daily Record/Sunday News. 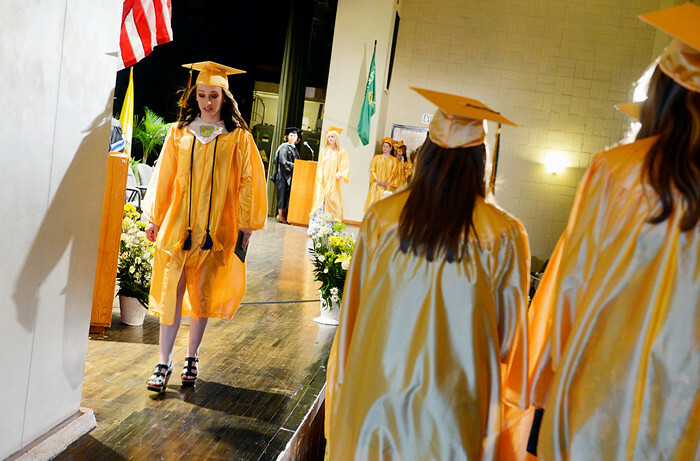 York Catholic graduate Mary Hale, left, exits the stage after receiving her diploma during commencement at York Catholic on Wednesday, May 28, 2014. York Catholic graduated 107 seniors in its 2014 commencement ceremony. © 2014 by The York Daily Record/Sunday News. 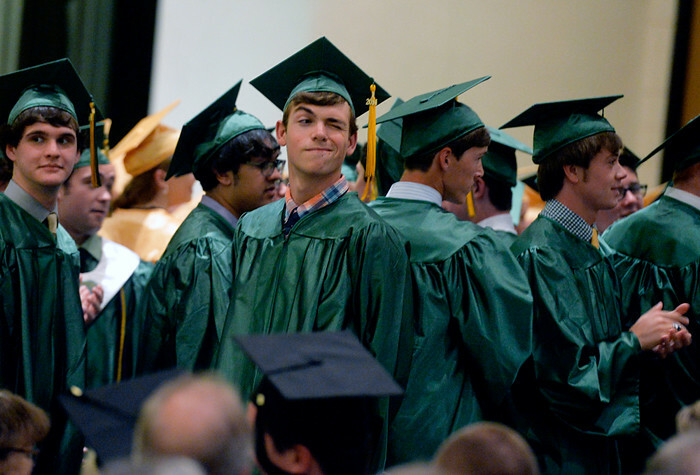 A York Catholic graduate winks at a friend in the audience during commencement at York Catholic on Wednesday, May 28, 2014. York Catholic graduated 107 seniors in its 2014 commencement ceremony. © 2014 by The York Daily Record/Sunday News. 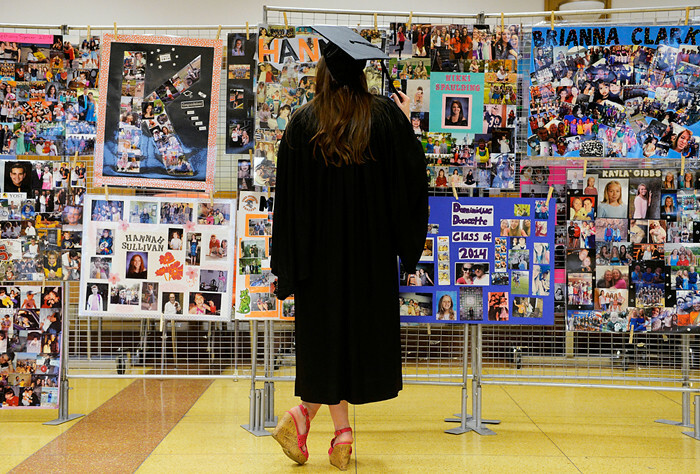 York Suburban senior Allie Patterson looks at photo collages of her classmates in the cafeteria before commencement on Thursday, May 29, 2014, at York Suburban. York Suburban had 213 seniors participating in commencement. © 2014 by The York Daily Record/Sunday News. (Left to right) Central York seniors Teal Kreft, Jaida Klyeman and Zane Knaub wait in queue for the procession before commencement at Central York on Friday, May 30, 2014. Central York graduated 445 seniors, 430 of whom participated in the 2014 commencement ceremony. © 2014 by The York Daily Record/Sunday News. Central York senior Pedro Tavarez pauses and acknowledges the crowd at the stadium for commencement at Central York on Friday, May 30, 2014. Central York graduated 445 seniors, 430 of whom participated in the 2014 commencement ceremony. © 2014 by The York Daily Record/Sunday News. 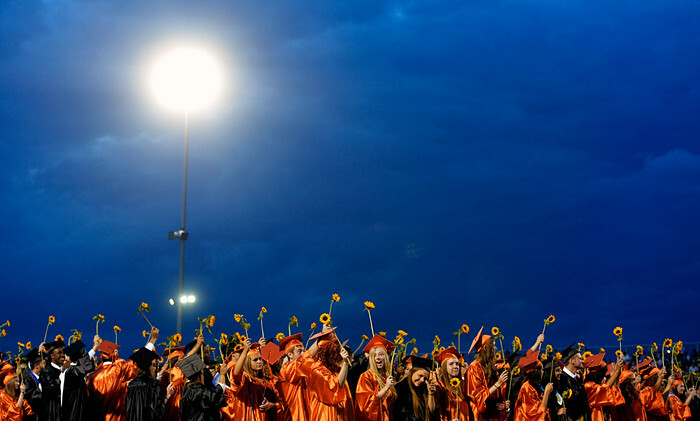 Central York graduates stand and wave their sunflowers during a choral arrangement of “For Good” from the Broadway musical “Wicked” at the end of commencement at Central York on Friday, May 30, 2014. Central York graduated 445 seniors, 430 of whom participated in the 2014 commencement ceremony. I didn’t intend for all of my favorite pictures from the next graduation — William Penn Senior High School’s — to feature one particular senior, but it just turned out that way. © 2014 by The York Daily Record/Sunday News. 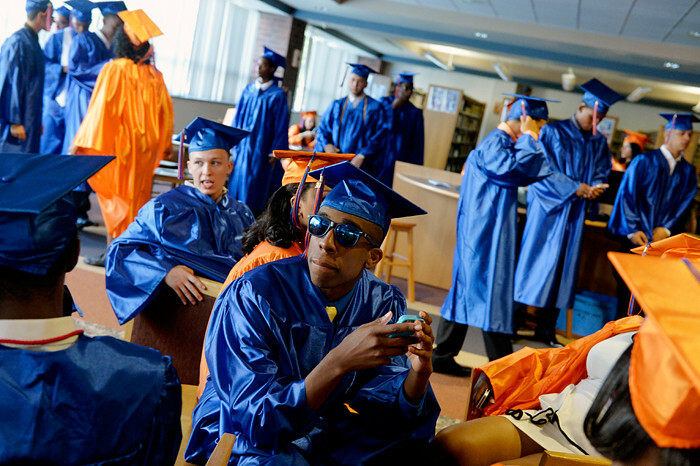 William Penn senior Jeshaun Maddox wears sunglasses as he relaxes in the school library before commencement on Friday, June 6, 2014, at William Penn Senior High School. © 2014 by The York Daily Record/Sunday News. 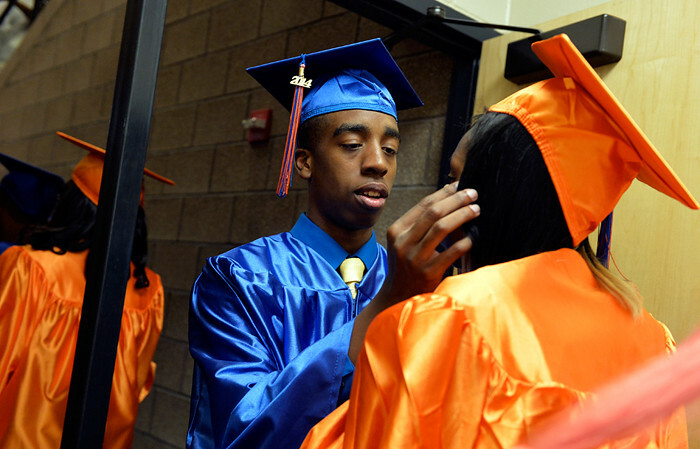 William Penn senior Jeshaun Maddox, left, looks back on classmate Symia Major-Kinard as she cries into a tissue as they enter the auditorium for commencement on Friday, June 6, 2014, at William Penn Senior High School. © 2014 by The York Daily Record/Sunday News. William Penn senior Jeshaun Maddox comforts classmate Symia Major-Kinard — and checks her face for tears — as they enter the auditorium for commencement on Friday, June 6, 2014, at William Penn Senior High School. 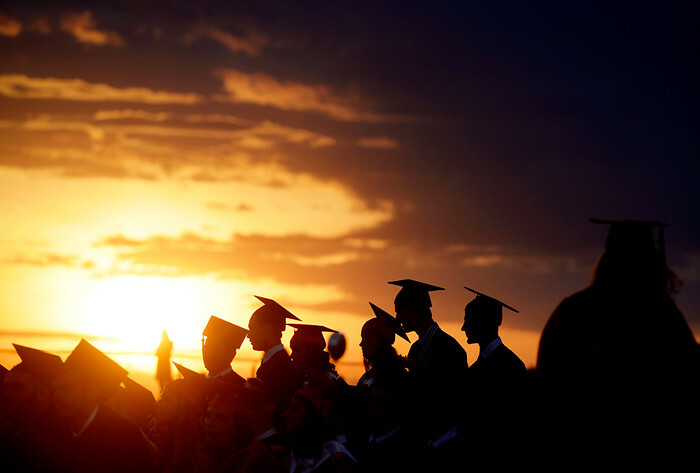 Congratulations to the Class of 2014, and best of luck to everyone! © 2014 by The York Daily Record/Sunday News. Central York seniors stand to receive their diplomas during commencement at Central York on Friday, May 30, 2014. Central York graduated 445 seniors, 430 of whom participated in the 2014 commencement ceremony.